In 2002, Telecare rolled out the Recovery-Centered Clinical System (RCCS), an innovative clinical approach to delivering mental health services that we developed in the course of 20 years. Below, we've outlined a few highlights for you to learn more about the basic structure of the RCCS and what it looks like at our programs. The RCCS promotes culture as a primary intervention. It addresses losses brought on by years of living in and being served by “power-over” systems and living in the greater dominant culture. The goal is to create increased awareness and behaviors that reverse the loss of power, judgment, motivation, individual uniqueness, and respect and dignity. The RCCS has five conversation areas to help engage staff with clients and begin building relationships that will support an individual’s recovery journey. Staff use conversational tools to help re-awaken hope and support people in resuming their unique recovery journeys. 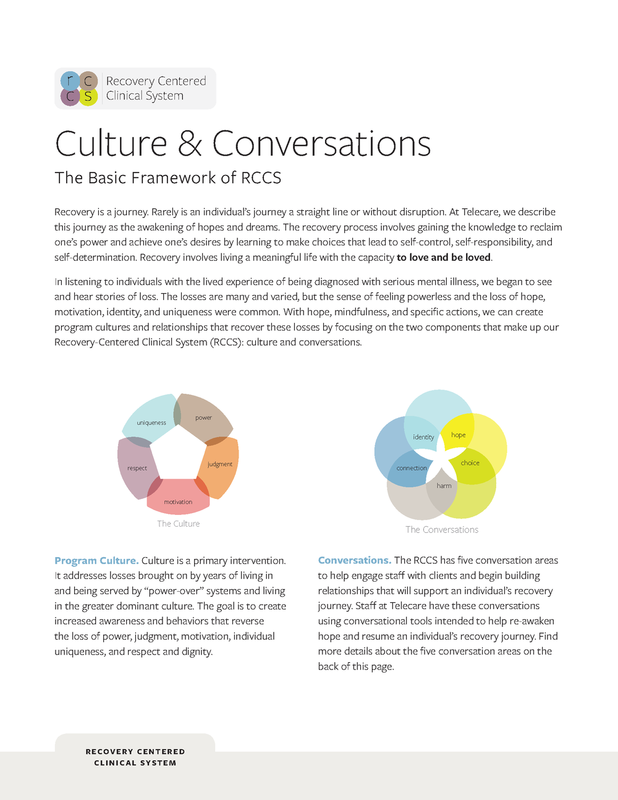 Find more details about the five conversation areas by downloading our Culture & Conversations: The Basic Framework of RCCS handout. The Recovery Centered Measures (RCM) is a validated tool that Telecare programs use to measure their recovery-centered culture. Staff as well as individuals served give feedback on how the culture impacts them and services being delivered. Results are used to identify and grow strengths within a program as well as provide an opportunity for culture improvement initiatives. From the development of programs to the delivery of services, the "awarenesses" of the RCCS show up in all sorts of ways. The model continues to evolve with our industry and is adaptable to the many types of programs we have. Our programs also serve a wide array of populations, and to be the most effective we need to have strong partnerships with our customers, communities, and the individuals we serve. 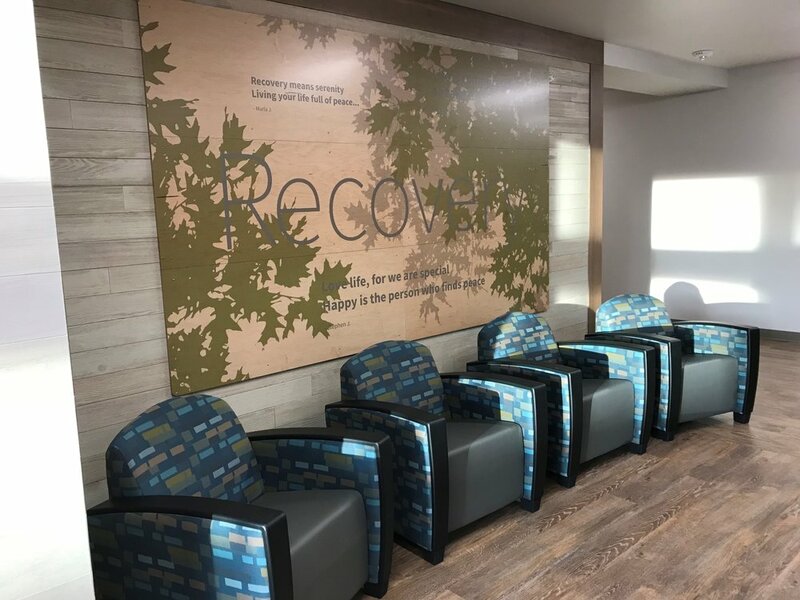 Recovery awaits at the King County Evaluation and Treatment Center in Federal Way, WA. High ceilings, natural light, and comfortable furniture help create a welcoming environment at Telecare's Lagos program in Riverside, CA. Murals cover the walls at our Recovery Center @ Gresham facility in Gresham, OR. To support the RCCS, Telecare designs its programs to create an environment where recovery can thrive. When a person chooses to walk through the doors of one of our programs, our goal is to welcome them to a home-like space where they feel safe and supported. We use art and color to inspire tranquility and mindfulness. Our nursing stations are typically open, not enclosed, to promote inclusivity and engagement with residents. While we know the work we do can be both rewarding and inspiring, it can also be demanding and stressful. It was Maya Angelou who said it best: "Nothing works unless you do." Finding a self-care practice for healing from or managing these stressors at work is essential for the wellbeing of staff, as well as for those they are supporting in recovery. Telecare staff use the RCCS's guided conversations and our Staff Resiliency Toolkit to build relationships with each other based on trust, teamwork, and wellness. We believe recovery is all about partnership—we partner with our members, our customers, and our local communities to ensure we do whatever it takes to engage individuals in our services and deliver the best possible outcomes. Telecare is committed to creating programs where recovery thrives and where culture is sustained to reinforce the values and principles of the RCCS. With that in mind, we have designed a robust training program for all staff and leaders of the organization. These trainings target new Telecare staff by introducing them to the two components of the RCCS: the program culture with its five awarenesses, as well as the five conversations of the RCCS. In addition, clinical supervisors attend in-person trainings that dive deeper into the five conversations: exploring identity, awakening hope, making choices, reducing harm, and making connections. These trainings help clinical supervisors develop their understanding of the intent and purpose of each RCCS conversation; understand the characteristics of being a good mentor, including giving and receiving feedback; learn and practice a strategy for skill building practice using a coaching feedback tool; and learn treatment/service planning using the RCCS conversations as targeted interventions. Additionally, program leaders attend the annual "RCCS for Leaders" training. This in-person training helps leaders develop skills to evaluate where and how the program practices exert power and control, and how to evaluate when and how to safely increase authentic control. Leaders also understand their role in facilitating the importance of staffs rituals that build hope and resilience. Check out some resources we developed for the RCCS by clicking the links below! If you'd like more information about our RCCS, tools we use to measure recovery culture, or related presentations and materials, please email: RCCSusage@telecarecorp.com.